This page on z-wave security covers basics of z-wave security used in zwave networks. • Custome Jey Establishment Protocol, as explained below. Z-Wave data origin authentication is based on the cipher block chaining message authentication code i.e. CBC-MAC technique. This technique calculates a message authentication code i.e. MAC from a block cipher algorithm such as AES. 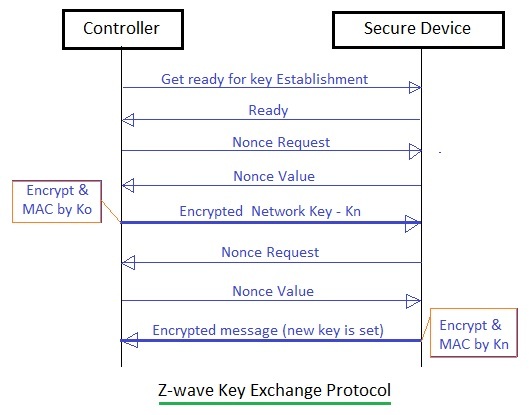 Figure describes K-exchange protocol used in z-wave security.